"With the education, we will no longer be underestimated. To those who always think that the trans-women only belong by the side of the road and at the red light will be able to see, no matter difficult the pressure that is given to us, we will definitely be able to pass it. The high education that I have achieved now is not only for me, but for the entire trans-women community, for all Indonesian people. So that we are all aware that education is our absolute right as the citizen. " That was Mami Yuli's motivation when she explained how education she has achieved until this point was not achieved easily. 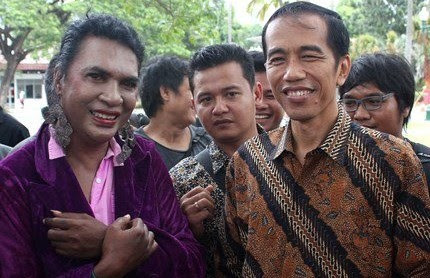 The struggle by the struggle continues to be faced and its success was pursued in various way to inspire the transgender community and the Indonesian people in achieving their vision. Yulianus Rettoblaut as known as Mami Yuli, 57 years old, is a trans-woman (transgender woman) who has a Bachelor's Degree of Law from Attahiriyah Islamic University. She then continued her Master's Degree at the Faculty of Law, Tama Jagakarsa University, South Jakarta, with the best citation (A+) and 3.85 GPA for 2.5 years. At that point, she was dubbed as the first transgender in Indonesia who was able to obtain a Master's Degree in Criminal Law. Not only that, Mami Yuli continued to pursue her dream and vision, and is recorded as a Doctorate Program Student at the Faculty of Law, Jayabaya University, majoring in Constitutional Law. Mami Yuli wants to be a living proof for her community that trans-women also has the ability and can perform well like her. "Trans-women, aside from being a marginalized society, are also the citizen who are consciously and openly often impoverished by the prevailing system in this country," according to Mami Yuli. Since 1979 until 17 years have passed, Mami Yuli has lived and worked in the streets, faced various forms of stigma, violence and discrimination from various parties including the society and the state. At that time, Mami Yuli was moved and she thought that the transgender community should not live on the streets forever. An empowerment program that is specifically aimed at the community is needed. For decades, Mami Yuli has struggled as an activist in empowering the community to get legal protection and their rights as the citizen, until this moment. "This law in Indonesia never sided with us as the transgender," Mami Yuli continued. Mami Yuli is recorded as the initiator of the establishment of the Rumah Singgah Waria (Transgender Shelter) which is recognized internationally as the world's first Transgender Nursing Home, later became an inspiration for transgender organizations in other countries to pay more attention to elderly transgender people. In the recent years, the usual assistance for the Rumah Singgah has decrease, even the Ministry of Social Affairs which previously provided support is no longer providing aid as a result of the increasing hostility towards the LGBTI community lately. Mami Yuli was forced to think extra hard for two things she loved, her education and the Rumah Singgah. Currently, Mami Yuli can barely accomplish her Doctorate Education due to financial challenge. In fact, just a step further, the Doctorate degree can be a pride for the trans-women community in Indonesia. But the situation said otherwise, the Doctorate public exam which became one of the conditions for obtaining the degree, turned out to require a huge cost. Mami Yuli must prepare at least US $6,750 or Rp. 100,000,000 (a hundred million rupiah) to be able to carry out the exam. This is the real condition of the education system in Indonesia, with all efforts to impoverish citizens who are already impoverished by the system itself. Let's Help Mami Yuli to get her Doctorate Degree in Constitutional Law, to inspire all citizens to get their rights, especially the right to a decent education, and also to give ways for Mami Yuli to continue her struggle, for the transgender community in Indonesia, as well as for all Indonesian people in general. And in time, we will all be a part of the success of Mami Yuli as the first and the only Transgender in Indonesia today, who is able to obtain a Doctorate Degree in Constitutional Law. The Indonesian Trans-Women Communication Forum/ Forum Komunikasi Waria Indonesia (FKWI) is an organization that carries out its mandate as a coordinated mean that focuses on social issues related to transgender women in Indonesia, both in terms of productivity of advocacy, social assistance, and group monitoring so that the rights of transgender women in the society is protected. One of the many social work carried out by FKWI is the Transgender Shelter which is aimed at empowering elderly transgender people. FKWI is led by Yulianus Rettoblaut or familiarly called Mami Yuli as its Chairperson.